When you have diabetes, you have to take special measures to protect your feet. Collectively, we refer to these measures as your diabetic foot care plan, and part of this is centered on making sure you wear appropriate socks and shoes. We’ve previously discussed what you need when it comes to shoes, but you simply cannot overlook the importance of wearing diabetic socks as well. Ultimately, the job of these socks is to provide maximum comfort while protecting your feet from problems that could become quite serious. 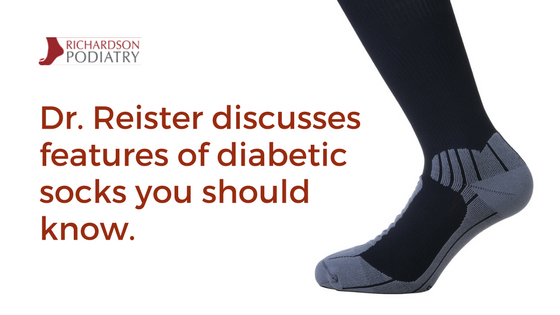 Typically, diabetic socks are seamless and non-elastic. The seamless design assists in minimizing both friction and neurological discomfort or pain. The non-elastic feature is intended to prevent circulation constrictions due to common swelling tendencies in the lower limbs from diabetes. Despite not having elastic components, these socks should fit well. This is necessary because restrictions in the calf caused by tight sock lines can limit circulation into the lower leg and foot. Impaired circulation is already a common problem caused by diabetes, and it slows the rate of tissue healing. You want to take every measure possible not to make that process even harder, because elevated blood sugar levels—which is a core problem with diabetes—slows down the immune system your body relies on for normal healing processes. Diabetic socks can be useful in fighting against this combination of issues. Wearing them on a regular basis may potentially reduce your risk of future amputations or even the onset of gangrene. In addition to the seamless and non-elastic features, these socks are also cushioned to a certain degree to prevent injury. At the same time, they have moisture-wicking abilities to prevent humidity building up between the sock and foot. This is important because feet already sweat a great quantity during the day, especially if the nerves responsible for controlling sweat glands are damaged on account of excess blood sugar. Proper cushioning and moisture-wicking features protect feet from the conditions that can cause blisters and fungal infections, both of which can be dangerous with diabetes. Often, these socks are made from a combination of certain materials, including merino wool, acrylic, bamboo, and even charcoal mixed with spandex (which enables stretching, but isn’t as constrictive as elastic). These materials are used because they offer greater moisture-wicking ability that traditional cotton socks. Additionally, they are more wrinkle-resistant, and that’s important because they minimize the risk for material abrasion on your skin. 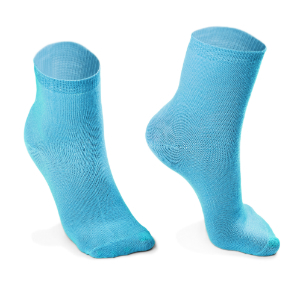 One final feature of diabetic socks is their anti-microbial properties. Wool, bamboo, and charcoal can lower your risk for bacterial and fungal growth in your feet. Given the impaired immune function caused by diabetes, your body needs as much help as possible to avoid infections from microbial organisms. Contact Richardson Podiatry Center today for all of your diabetic—and nondiabetic—foot care needs. Give us a call at (972) 690-5374 and one of our team members will be happy to assist you.